A year ago GASP began urging the Allegheny County Health Department (ACHD) to do more to eliminate violations of the County’s hydrogen sulfide (H2S) standard and the offensive rotten egg odors that go along with those violations. GASP documented that the H2S standard has been violated on average more than fifty times a year, over the past six years, according to readings from the Liberty Borough monitor in the Mon Valley. At the ACHD Air Quality Program Criteria Pollutant/Air Monitoring subcommittee meetings, we repeatedly insisted that ACHD staff look into the problem and do more to reduce these illegal emissions. We are pleased to report some progress is occurring. At a recent meeting of the subcommittee, ACHD provided a preliminary study which compared the frequency and intensity of H2S concentrations with weather conditions and other pollutants at the Liberty Borough monitor from 2013-2017. The study concluded that there was no seasonal trend in the occurrence of high H2S concentrations but there was a daily trend: most of the highest H2S readings occurred between 8 p.m. and 10 a.m. It is likely our region’s frequent atmospheric inversions, which occur at night, are trapping the H2S closer to the ground. ACHD also concluded that sulfur dioxide (SO2), benzene, and fine particles (PM2.5) appeared to increase with an increase in H2S. These are all pollutants highly associated with coke-making. 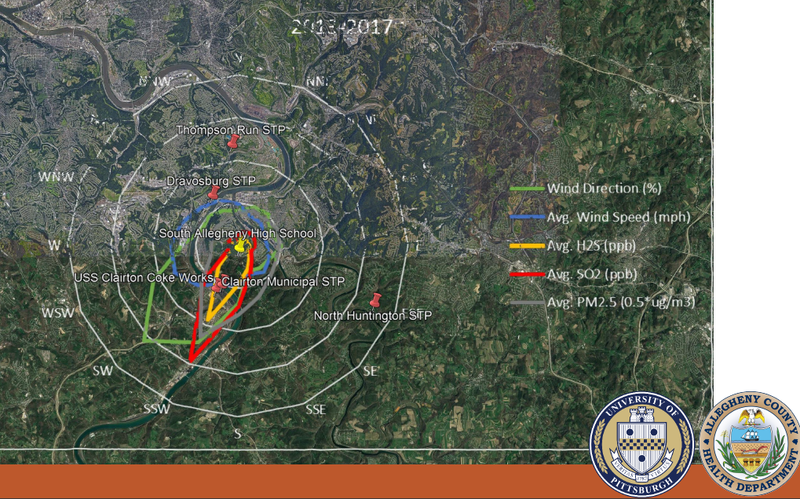 The study also revealed that most of the highest hourly H2S, SO2, benzene, and PM2.5 readings, at the Liberty monitor, typically came from the south, south-southwest, and southwest—which is in the general upwind direction of U.S. Steel’s Clairton Coke Works. ACHD concludes that, “Based on location and amount of reported emissions from USS Clairton, it is likely a substantial contributor to the H2S, SO2, benzene, and PM2.5 concentrations.” Is anyone surprised by this? We weren’t. U.S. Steel’s Clairton Coke Works is by far the largest emitter of H2S in the county, emitting more than 109 tons in 2017, according to the PA Department of Environmental Protection’s eFACTS online data portal. While we were glad to see ACHD put some effort into examining the problem, what we are most interested in is—what’s next? We know that the Air Quality Program’s Regulation subcommittee is currently reviewing the coke oven regulations. Will revisions to the regulations help to reduce H2S emissions coming from Clairton Coke Works and the rotten egg odor that permeates so much of the Mon Valley and downwind areas? That is yet to be seen, but we will keep you posted. This is a welcome but overdue step in the right direction. Any changes to the County’s air quality regulations must go out for public comment, and we will need your voice when that happens. I, too, look forward to seeing what the ACHD does to reduce the stench that has contributed to over 10,000 SmellPGH app comments since 2016. This is a real problem. Citizens demand corrective action that protects health AND our right to non-stinky air. Great start. Now we must keep up the pressure to get long overdue cleaner air results! When the sulfur smell gets bad here in the east end, the culprit is usually Edgar Thomson. This would indicate that the problem has to do with the improper quenching of the slag where by the water combines with the with the sulfur compounds left over from the coke to produce excessive levels of H2S. Have there been any recent reviews of this process and the iron production rates? Maybe additional slag pits need to be added for longer cooling times before quenching. Or are Oxidizing agents added to the cooling water to reduce the creation of H2S? Thanks for the comment Chris; we’ll be in touch about ET. When I came back to Pgh for my dad’s funeral in about 1988, I was astounded the daily newspaper failed to report the terrible odor forcing me to close windows in the south hills. Having been away from this area for some time, I seemed to be the only one who noticed why Dad died from a congestive heart/breathing disorder after his lifetime in the SOuth side/hills. Now, indoor smoke at Swissvale Towers is pushing me, too, toward COPD disability and death. I am outraged.